Step out of clock time. Gaze at this painting without thinking. Just for three minutes. When your mind wanders bring it back to the painting. Try and gaze at it with open awareness, allowing whatever emerges to emerge. The original painting by young artist Emily Marten is a square. The whole painting is, like the square, harmoniously balanced. 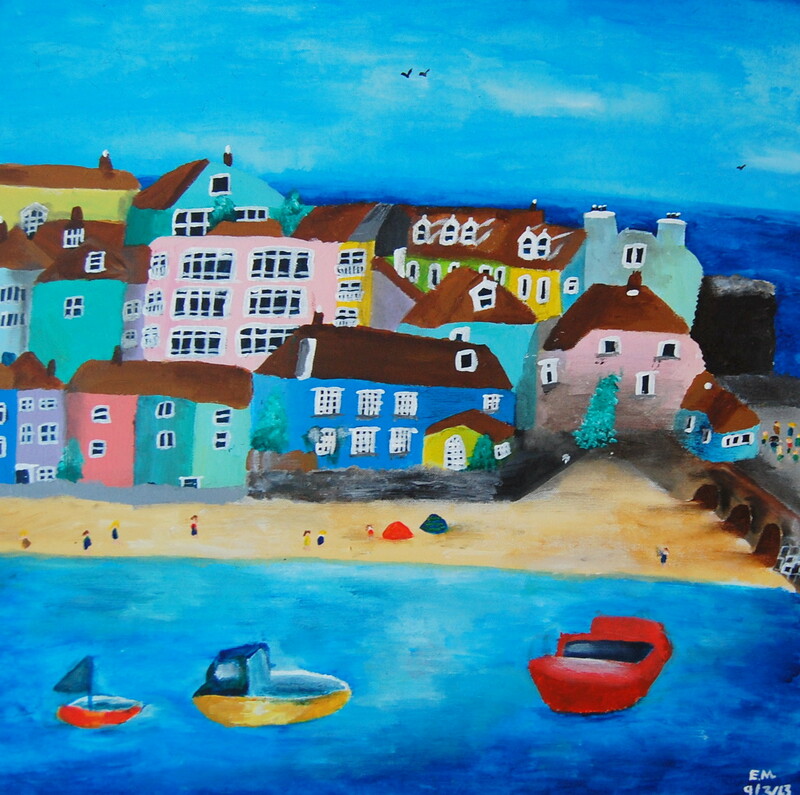 What the artist has been able to do is look beneath the surface of the houses and the people, and draw out the colour of the emotions felt on this sunny, windswept day in St Ives, Cornwall. If you ever wondered what the colours of joy and play and happiness and hope are, these are the colours, normally hidden away. It’s as if the artist has been looking down from where there are no clouds, reached in to the heart of the moment and pulled out the feelings of this place by the sea, with the special light. I have been to this painting in real life, and that is where I am taken back. I can almost breathe again the happiness of walking on the beach, feeling the sand beneath my toes, the wind in my hair, and the sand on my face. Perhaps the sting of drying salt water on my arms. I am sure I can feel that. As a painting it is like the Tardis. It reminds us that we are bigger on the inside than the outside. it’s called Harbour Bay. There in Harbour Bay I feel safe and free. I have been taken to that place within. Let the painting befriend you. The artist has attached summer to the canvas for us. Lovely – I did the exercise before reading the rest, and found I’d had similar feelings. btw – mindfulness of pictures (mostly paintings) was popular with my patients. – ‘works’ on so many levels. an example of being mindful looking at a picture – this type of mindfulness was popular with my patients – I had a collection of postcards of assorted paintings and some photos and used to invite them to choose one, noticing what it was that drew them to the picture – interesting reflections afterwards. What a lovely painting, it makes you happy and evokes a gentler time when we were children wandering along the beach looking for shells and watching the sea curling into the sand, magical.